When you file for divorce, you do not immediately wind up in court preparing for trial. 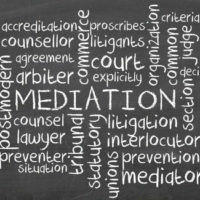 It is possible to negotiate the terms of your divorce in an out-of-court setting – mediation. This is where both you and your spouse agree to meet with an independent third party (i.e. the mediator) and try to resolve any points of contention concerning the terms of your divorce. The mediator does not take sides one way or the other. Instead, their objective is to help you and your spouse discover your own solution. There are many benefits to agreeing to mediate your divorce. First and foremost, mediation can help save you time and money, especially when compared to the time and costs associated with a divorce trial. You do not have to worry about discovery (e.g. interrogatories, requests for production of documents, etc. ), court hearings, and so forth. With a mediator, you can meet privately to discuss your divorce in a less intimidating atmosphere. Another advantage is that mediation can ultimately result in a better deal for both you and your spouse. This is mainly because, as mentioned, you all are driving the mediation discussing the most pressing issues and areas of disagreement to ultimately, in the end, reach an amicable settlement agreement. When you get into litigation and ultimately a trial, a judge will be empowered to impose a decision and you may not be pleased with how they decide to divide marital property, the award of child support and spousal support, etc. There are some drawbacks to mediation you need to be aware of and prepared for. A common drawback is an uncooperative spouse. You cannot force your spouse to participate and neither can the mediator. If they refuse or walk into the mediation making wild demands, there’s not much that can be done. If there is a history of physical or mental abuse by one spouse against the other, then mediation may not be the best forum for resolving areas of disagreement in the divorce. The abusive spouse might try to manipulate or intimidate the other spouse to gain an advantage in the settlement negotiations. Mediation is often pursued when a court orders the parties to engage in a mediation session (also known as mandatory mediation), or when you and your spouse mutually agree to give it a shot. There is typically a preliminary meeting between you the mediator to get some basic background information, find out the key areas of disagreement, and dictate the rules and guidelines for the mediation session. A joint session will then be scheduled where the parties meet with the mediator to try and resolve their differences. Your Houston divorce lawyer should be there with you during the mediation and review any proposed agreement prior to you consenting to the terms. If an agreement is reached, the mediator will write down the terms in some kind of memorandum and submits it to the judge assigned to your case. In most cases, a court will generally approve the memorandum and enter it into the court record as an order. Mediation has its benefits and drawbacks. To determine whether it makes sense in your case, you should speak to one of the experienced lawyers at Lindamood & Robinson, P.C. Our legal team is comprised of skilled Houston family law lawyers who can meet with you when you are ready and discuss your legal options and strategies. Contact our office to schedule a consultation.